Dennis Sheehan, born in Boston in 1950, is a member of the Guild of Boston Artists, and currently lives and works in the New Hampshire countryside. 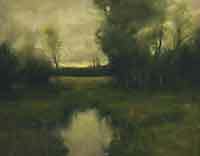 His work is in major public and private collections, including the White House. 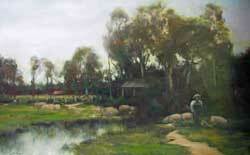 Sheehan paints in the Barbizon mode with remarkable authority and faithful adherence to his 19th century precursors. 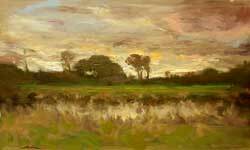 In the tradition of the Tonalist painters, Sheehan creates landscapes of mood, affected by nature's changing seasons. "My goal is to have the painting emanate light, rather than be just a surface that records the reflections of light. This is why the shadow areas are important, for it is from them that this emanation proceeds. The light areas are focal points of this effort, but the power comes from the shadows."